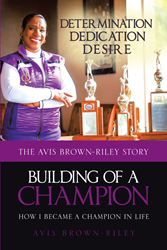 Recent release “Building of a Champion” from Page Publishing author Avis Brown-Riley is a heartwarming narrative about the author’s journey towards being a golf champion, and being a champion in her personal life. Avis Brown-Riley, a loving wife, and mother of two children, and a renowned golf champion who was inducted into the San Diego Hall of Champions and the African American Golfers Hall of Fame, has completed her new book “Building of a Champion”: an evoking and provocative true-to-life account about the author’s perseverance as a golfer and woman of character. Published by New York City-based Page Publishing, Avis Brown-Riley’s uplifting story looks back to the time of her profound experiences as an amazing golfer – from her early playing experiences to eventually becoming a champion – as well as her life-changing battle and victory against illness and adversity. Dreams can come true. See how a little girl becomes a Champion in Golf, a successful manager in a Fortune 500 company, survives breast cancer, and learns to Become a Champion in Life. Readers who wish to experience this encouraging work can purchase“Building of a Champion” at bookstores everywhere, or online at the Apple iTunes store, Amazon, Google Play, or Barnes and Noble.